The hazy cigarette smoke dulls the bright lights and silver balls which bounce around the frame onto the pins. Tolling bells and distinct cartoon voices echo around the room while adrenaline pulses through the hundreds of players seated in a row. Welcome to a pachinko parlour. Irrespective as to whether or not the Japanese government let you believe it, a pachinko machine is Japan’s version of a poker machine. We take a look at the addictive game and the parallels it draws with the real money gambling machines at land based casinos. What is a pachinko machine? Pachinko machine features bright lights and silver balls. 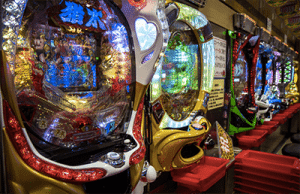 This popular machine played by millions of people in Japan is similar to a pinball machine – and is perhaps where the creator drew their inspiration. It has been around since the 1940’s and while they’ve advanced extensively the same premise of a mechanical gambling game has always been present – whether the government want to admit it or not. The Pachinko see’s multiple steel balls thrown from the top of the machine and these balls are then controlled by where they land – specifically what pins they land on – and gravity. The player only controls the speed at which they fall at the start of the game which means they are ultimately quite passive – they simply have to watch and hope to win if the balls fall into the holes. The more balls you have the better you will go since it will give you a better chance at winning – the aim is to land the balls on three numbers or symbols in a row for a payout. While Japanese law prohibits casino gambling at the time of writing, many players can exchange the balls they’ve won at the gift shop for perfume, beer, jewellery and more, or head outside to a tuck shop to exchange for cash. 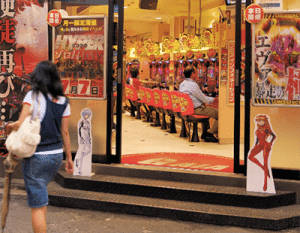 While this may be a loophole Pachinko players have exploited as cash isn’t being exchanged directly, the Japanese government has done little to close the gap. There’s also the issue of whether or not exchanging the winning balls for gifts from a shop counts as gambling. Pachinkos are found in parlours all over Japan. Pachinko machines sound incredibly similar to pokies on paper, but according to the Japanese government they aren’t classified as gambling machines. Instead they they’re just games – skill-based games at that. Many say you don’t need skill with pokies due to the simple requisite of spinning the reels by pressing a button or pulling the lever, but pachinko apparently requires good aim when it comes to launching the balls. Interestingly, a lever has to be pulled to launch the balls on the pachinko. The latest Japanese anime or popular TV show in Japan generally dominates each machine which is incredibly similar to pokies and their themes – often depicting popular Western movies such as Batman or The Hangover. Additionally, according to the web the most addictive feature to the pachinko is the REACH function. A REACH occurs whenever you’ve landed two of the same numbers or symbols and you have to wait to see what the third result will be. Here the LCD screen changes to a battle between a hero and a villain – the number or symbol you want is represented by the hero. If the hero wins the battle – you win, but the villain usually wins. Audio and graphics are triggered here and you can see the beads of sweat form across the player’s head as they wait for the result. This is incredibly similar to the bonus features including Free Spins on a pokies machine. You can find pachinko machines everywhere in Japan. According to an article on Japan Society, each year millions of Japanese spend, on average, $200 billion on pachinko machines, and lose around $40 billion of it. This is in comparison to Australia’s average of $20 billion lost on the pokies per year – and it’s perfectly legal to gamble Down Under. In fact, there are several stories available on the web involving Japanese players who have lost everything to Pachinko games. A 45-year old Japanese man who had begun playing pachinko in his early ‘20s began to lose more than he earned at work. After five years, he had to borrow 1.5 million yen (around $AUD17,464) to cover the losses he accrued from playing these machines. Eventually he couldn’t even pay the debt back so he stole from his work, and while his bosses didn’t sue when they found out, they did fire him. This story is just one of many, which makes it incredibly alarming there’s no legislation regulating the industry – we have laws in place to protect vulnerable players, for example you have to be 18 to play, and to ensure the machines aren’t rigged in the operators favour. Land-based pokies have to have a minimum RTP of at least 87% in Australia – there’s no law for the payout rates on Pachinko machines since they are technically called skill-based games. Additionally, there’s no identification required to enter a pachinko parlours and play so it’s quite easy for a 16 year old to walk in and enter money to win the latest toys – or even exchange the gifts for cash. It has been reported in recent years the police are more active in regulating the parlours but while this may serve as a deterrent for crime it doesn’t act as a service to help people with addiction. What’s more these machines are absolutely everywhere – not just limited to pubs, clubs, RSLs and casinos as they are in Australia. It will be interesting to see what happens if the ban on casino gambling is lifted in Japan and whether the category these games fall under will change – thus resulting in regulation.